As an additional quality-check measure, additive manufacturers screen incoming (or ‘virgin’) powders before use in production. Containers of powder such as titanium, aluminium, stainless steel, copper and other metals, plastics and ceramics must be check-screened using an industrial sieving system, removing contamination and oversize particles that would compromise final product quality. Due to concerns with material contamination and operator health and safety, a high-performance automated additive manufacturing powder sieve with minimal operator involvement is required. Used additive powders can be reclaimed from 3D production systems, check-screened and reused. Due to the physical changes that can occur to the unused powder during the build process, hidden deteriorated and oversize particles would compromise the quality of the next build. Therefore, these 3D printing powders must be re-conditioned or re-qualified before reuse. 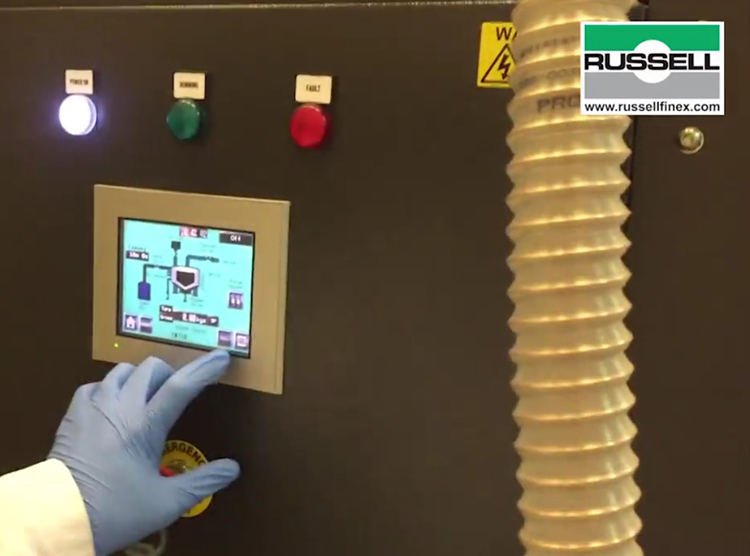 In a Russell Finex demonstration video, watch virgin titanium powder being qualified for use in additive manufacturing, using the Russell AMPro Sieve Station™. The powder is transported from the container into the additive manufacturing powder screening station. The unit is then purged with inert gas, before the sieving process begins. The entire process can be automated, and the HMI screen clearly displays each operation. Once the machine is fully purged, sieving is commenced. The titanium powder is automatically fed through the high-performance vibratory sieve, where all contaminated particles are removed. The qualified powder is collected in a container, ready for use in production, and the oversize contamination is removed from the process without the loss of good powder. With a simple one-button operation and mobile design, this automated 3D printing powder sieve ensures powder at any stage of the additive production process is qualified for use quickly and safely. Its flexibility means this system can be applied to numerous powder handling tasks. The system allows full containment and can be purged with inert gas. A compact and mobile design allows easy integration into existing production processes, and minimal contact parts mean quick and easy dismantling and cleaning. Established in 1934, Russell Finex has over 80 years of experience in processing metal powders, and has worked within the AM industry since its beginning. The company has built relationships with key global manufacturers, enhancing Russell Finex’s reputation as a global leader in advanced sieving technology and supporting the evolution of AM powder management.